In this series, we’ll discuss how automation can benefit the trader throughout the trade lifecycle and explore some of the tools and services MTS provides to support your automation efforts. In part one, we’ll focus on how automation is changing the way participants trade, the critical role of high quality data in trading strategies, and why automated execution is the future of trading. 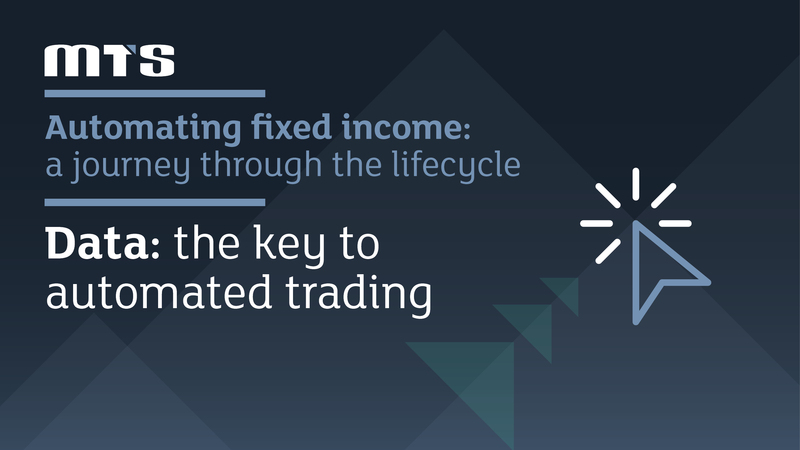 The role of the fixed income trader is radically and rapidly transforming. As more workflow shifts onto electronic platforms, computers and algorithms play an increasingly crucial role in supporting traders by automating a vast range of processes. Even before the trade is placed, automation can play an important role in helping traders identify the right trade at the right moment. From providing quantitative analysis to support human traders, right through to automated trading, algorithms have an increasingly important role to play when it comes to selecting the trades to make. While automated trading technologies have been a mainstay of the equities market for some time, the fixed income market is now rapidly following suit as more trades are conducted electronically. The emergence of new technologies such as machine learning and wider availability of APIs for trading have enabled bond traders and their algorithms to take automated electronic trading to the next level. These algorithms can be incredibly powerful when fed with the right data. However, algorithms processing incomplete data sets can not only be ineffective, they are potentially dangerous. While human traders can use intuition to guide themselves through a period of unexpected market volatility and avoid the worst of a crisis, algorithms can only refer to the information that they already have. If an algorithm has not been back tested on a long enough range of data, including periods of volatility, the algorithm can make inaccurate decisions which could be extremely costly. Comprehensive historical data is, therefore, a prerequisite for effective pre-trade automation technology. This data needs to be available for a substantive time period and be thoroughly cleaned if it is to facilitate the building and testing of algorithms to be used to feed automated trading features on electronic platforms. MTS provides a broad range of automation solutions to match a firm’s specific level of sophistication, but data is at the heart of each of our offerings. While we are often most closely associated with the government bond market, our data spans asset classes and is also available for repo products and US corporate bonds. In government bonds, the real-time order book data is sourced directly from the 18 interdealer trading venues we operate, which support trading in over 2,500 different bonds. We are the only player in the fixed income space that integrates interdealer market data directly into a dealer-to-client trading platform. Our European government bond data provides actual traded prices or executable prices – never indicative – that are live on our platforms. It is sourced from a diverse trading community which generates 30 million daily average orders per day. The majority of the electronic Euro-denominated government bond market volume has been traded on our markets for over 30 years, and therefore our data can be regarded a highly accurate representation of trading data in these markets over a significant period of time. Data is also crucial to our offering in the corporate bond and emerging market debt spaces, where our MTS BondsPro platform offers traders an innovative all-to-all model that boosts liquidity by enabling anyone to act as either price provider or price taker. Pre-trade data on the platform is derived from over 650 buy-side and sell-side market participants and is distributed in real-time. Users see the full depth of market, which is particularly valuable for determining a bond’s liquidity pre-trade. Market participants can access these limit order book prices every day on over 17,000 corporate bonds in USD and other currencies. This comprehensive and detailed data can be used to rigorously back-test quantitative algorithmic strategies and even to train advanced machine learning tools. Automation of the fixed income workflow begins with good, comprehensive pre-trade data. Feeding APIs and innovative new automation tools with inaccurate or incomplete data is inherently risky. Put simply, bad data in equals bad data out. Take this risk out of the equation by relying on a trusted data provider and market facilitator to lay the foundation for automating your fixed income business. Once the algorithm, or the trader with the aid of automated tools, has selected their trade, it is time for trade execution. Here automated tools also play a pivotal role. Many buy-side fixed income desks break their trades down into ‘low touch’ straightforward trades and more complex ‘high touch’ trades. These low touch trades can be quite manually intensive to perform and yet are often relatively routine. This makes them prime candidates for automation. This can free traders up to spend their time handling more complex high touch trades and make traders more productive. However, it is essential that traders maintain control and visibility over their automation strategy, especially when it comes to automated trade execution. To support this, MTS’s newly redesigned BondVision trading platform provides an automated execution facility which allows traders to upload trades directly from their OMS and have BondVision automatically handle the RFQ and execution process based on the trader’s pre-set parameters in the rules engine. More than 20 auto execution parameters can be configured directly from the new BondVision platform, giving traders a maximum level of control while allowing them to reap the efficiency benefits of automation. This feature gives buy-side firms a user-friendly method with which to build advanced trading models for automated order execution across all asset classes including government bonds, corporates, financials, covered bonds and SSAs. Users can create, edit and delete automated execution rules in real-time, directly from the BondVision trading platform, enabling them to update their trading strategies as market conditions fluctuate. This is complemented by real-time alerts and a detailed audit trail, ensuring full visibility. Even trades which are negotiated over the phone can be booked as Processed Trades on BondVision, allowing the trader to benefit from trading on a regulated MTF with full straight through processing (STP) and venue support, just like with an e-trade. Automated execution is set to become the new normal in fixed income trading as increasing electronification continues to change market infrastructure. MTS’s new BondVision design enables traders to manage their automated execution rules in real-time with a full audit trail, putting them back in control.